The holiday season runs the last six weeks of the year, from roughly Thanksgiving through New Year’s Eve. Six weeks isn’t much time to squeeze in all the parties and celebrations, shopping and wrapping, and special memory-making that comes with the season. Many of us also juggle family caregiver duties, which carry emotional weight and extra physical tasks on behalf of a loved one. Caregivers need to manage their physical and mental health during the holidays, so everyone can enjoy themselves. 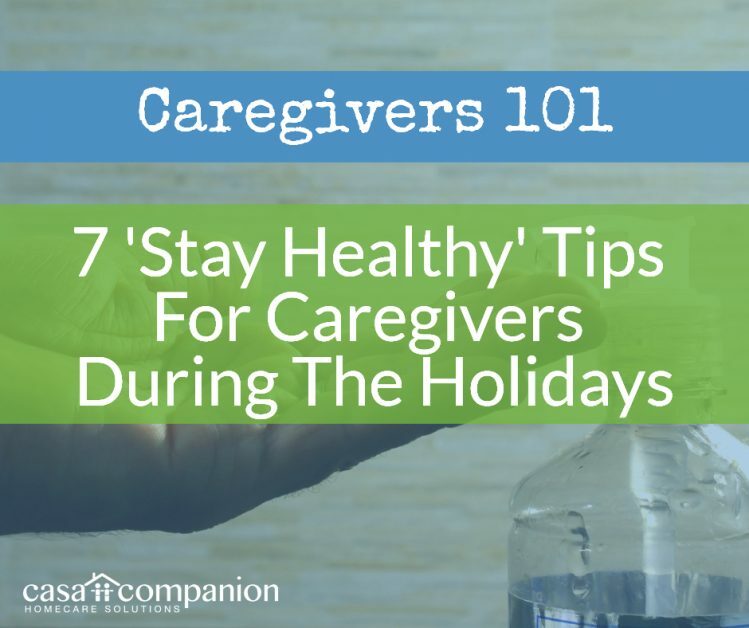 Here are seven ways for caregivers, home care aides and loved ones to stay healthy and happy during the holiday season. Tip #1: Don’t get sick! The best way to not get sick is to be pro-active about avoiding germs. Carry disinfect wipes for doorknobs, grocery cart handles, escalator railings, and elevator buttons. If you can’t wipe a surface off discreetly, then use hand sanitizer after you touch it. Wash your hands frequently. Read our blog from December 2016 for the CDC’s advice on handwashing. Avoid airborne germs by wearing a face mask – don’t worry, Michael Jackson made it cool. But handle the mask with care when you’re ready to take it off. All the germs you didn’t breathe in are stuck to the outside, so fold it carefully and dispose of it so you don’t have to touch it again. Tip #2: Stay hydrated! Just because the outside temperatures are low doesn’t mean you don’t need fluids. Drink your beverages at room temperature. Cold water is absorbed faster, but your body expends energy to warm that liquid up. Drinking warmer beverages will keep your internal temperature steady. Even in San Diego, cold weather means drier air, which dries up the mucus membranes in your nose. A dry nose can’t catch the germs that you breathe in, so to keep the cooties out of your airways, keep the inside of your nose moist. Cold, dry air also makes your lungs work harder. Your lungs require moist air, so the drier the air you’re breathing, the harder your body works to moisten the air once it’s in your lungs. The more energy your body expends, the more water you need. You need to stay just as hydrated in the winter – yes, even a San Diego winter – as you do in the summer. Tip #3: Stay active! You might not burn as many calories as you’re eating during this ‘what the heck, it’s a holiday’ time of year, but don’t give up! If you have a regular exercise routine, keep it going! It’s tempting to focus on the fun, but you need the endorphins, the movement and the structure. Everything in moderation: don’t overdo it, either! It’s winter time, so go outside to enjoy that crisp, fresh air! This time of year can be stressful, and staying active is one of the best ways to recharge your batteries. Tip #4: Keep your immune system strong! A weakened immune system doesn’t just fall prey to germs, it can cause fatigue, weight gain, upset stomach, and a low stress threshold – which you don’t need this time of year! Be sure to eat well – make sure you get your fruits and vegetables along with holiday treats. Get enough sleep. Yes, there’s plenty of fun stuff to do, and to-do’s to take care of, but prioritizing sleep and self-care is just as important. Watch your food hygiene! Party food left out for hours, or contributions from people who only cook once a year for potlucks, can host plenty of germs. Did you know that December is one of the most common times of year for people to get food poisoning? Eat with caution. Tip #6: Stay mentally strong! Keep your mental immune system strong by avoiding stress and keeping your batteries charged up. All families have friction, so do what you can to keep things light. Accept your family and loved ones for who they are, and you’ll find joy in their company. Keep it simple. Don’t overdo social events, gifts, or decorations – at some point, more isn’t better. Don’t go gift-crazy, especially if you’re on a tight budget. Give memories, experiences, and time. Focus on self-care wherever possible. Stay strong for the people who depend on you. Tip #7: Take time to enjoy the season! As the song says, it only comes once a year! To keep your mood bright, focus on what’s special about the season: family & friends, the joy of giving, and both giving and receiving acts of kindness. Enjoy the things that only come this time of year: beautiful light displays, Starbuck’s eggnog, and ice-skating rinks in San Diego!